How do I change my campaign goal? 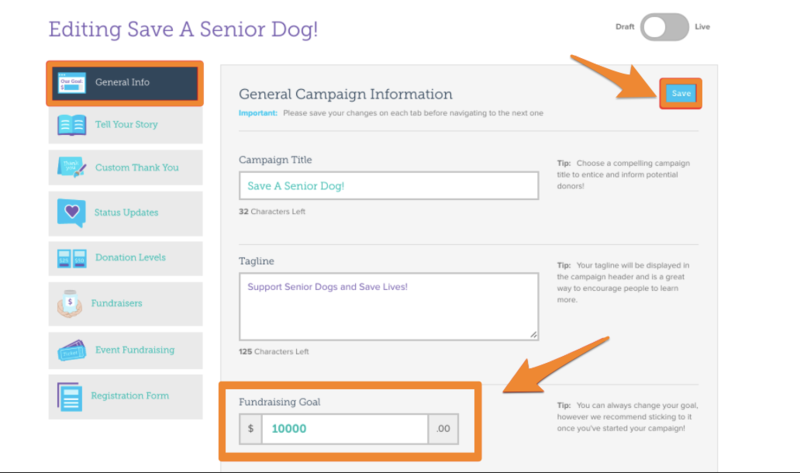 Easily change the donation goal to meet your campaign's needs. From the Overview Tab of your Admin Dashboard click on the "Campaigns" box in the center of the top row, or expand the "Fundraising" tab on the left hand side of your dashboard and select "Campaigns" from the drop down menu. Once you have navigated to the campaigns page, click "Edit" on the campaign you'd like to update. From the General Info Tab of your Campaign editor, enter your new goal amount in the text box highlighted below and click the "Save" button. Once you've saved your new goal it will be automatically reflected on your campaign.